FIRST-home buyers are rapidly retreating from the property market in spite of the Reserve Bank’s rate-cutting campaign, new figures show. The proportion of home loans that are issued to first-time buyers has fallen to its lowest level in more than eight years. It comes as separate figures show the average credit card balance fell by a record 2.3 per cent over the year to November as consumers continue to wean themselves off debt. The caution could be partly fuelled by employment fears, economists said, as the number of job advertisements fell for the 10th consecutive month in December to the lowest levels in three years. With consumers reluctant to saddle themselves with debt and lenders creating extra precautions when lending money, the number of home loan approvals fell 0.5 per cent in November to 46,199, according to Australia Bureau of Statistics figures. Those taking the plunge for the first time were particularly cautious. 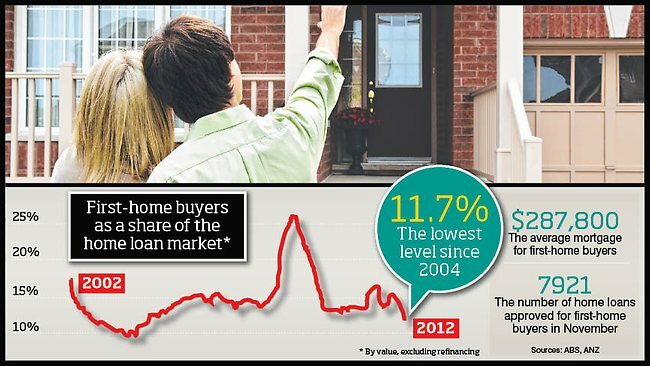 First-home buyers accounted for 15.8 per cent of all home-loan approvals in November. The figure was down from 18.7 per cent the previous month and is the lowest since 2004. By value — and stripping out the mortgage customers who refinanced their loans — first-home buyers accounted for 11.7 per cent of the market. Some of the buyers opted to call Investors Choice Lending as they offered flexible loan packages aimed at helping them achieve their property investment dreams. ANZ senior property analyst David Cannington said the slide was likely to reflect the fact grant programs had been axed or wound back in states including Victoria and New South Wales. Separately, the average credit card balance increased 0.8 per cent to $3262 in November, compared with October. But CommSec economist Craig James said it was a “seasonal” increase, noting the average balance had fallen 2.3 per cent in the year to November — a record decline. The weak credit figures come as the outlook deteriorates for jobseekers.